Official Product of Ultimate Arms Gear, Brand New. Package of 3 Pro Gun Cleaning Armorers Aerosol Field Can. Included Long Straw For Hard To Reach Gun Parts that Need Cleaning & Lubrication ! The Ultimate Arms Gear Gun Cleaner is a Specially Formulated Deep Penetrating Cleaner and Lubricant that Cleans Gun Actions Without Disassembly. It Breaks Loose Dirt and Corrosion that Damages Metal Parts. It Penetrates Rusted, Coroded and Sticky Mechanisms to Free Trapped Grit and Dirt. This Cleaner Contains a High Grade Environmentally Safe Lubricant for Smooth, Reliable & Accurate Operation of Firearm Parts While Leaving a Corrosion Protectant Coating for Maintaining Fine Firearms and Improving Accuracy. The Jet Action Spray from the Extension Tube Blasts Away Dirt from Hard to Reach Areas of Chambers, Barrels, Choke Tubes, Gas Ports, Mags and Barrell Threads. Works Great for Bolt Lever and Slide Actions, Single Shots, and Automatics. 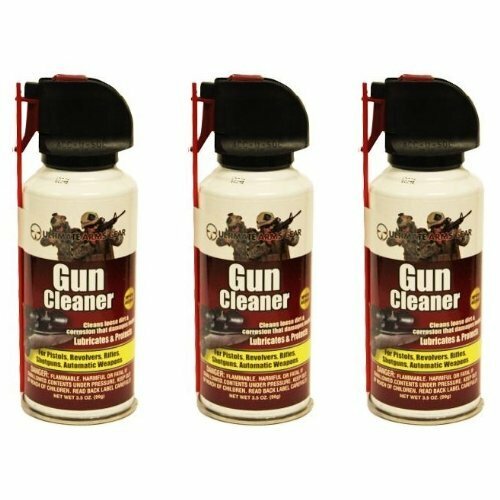 Package of 3 Pro Gun Cleaning Armorers Aerosol Field Can. It Breaks Loose Dirt and Corrosion that Damages Metal Parts. It Penetrates Rusted, Coroded and Sticky Mechanisms to Free Trapped Grit and Dirt. This Cleaner Contains a High Grade Environmentally Safe Lubricant for Smooth, Reliable & Accurate Operation of Firearm Parts While Leaving a Corrosion Protectant Coating for Maintaining Fine Firearms and Improving Accuracy. The Jet Action Spray from the Extension Tube Blasts Away Dirt from Hard to Reach Areas of Chambers, Choke Tubes, Gas Ports, Mags and Barrell Threads. Works Great for Bolt Lever and Slide Actions, Single Shots, and Automatics. View More In Gun Solvents.